Not in the mood to eat rice but want to get energized? Well, here is the best salad for you! 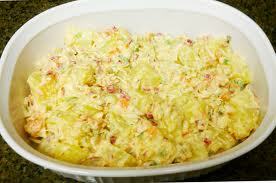 Potato salad has a lot of variations depending on what other ingredients you are to add in your salad. Some add hard-boiled eggs to complete the dish. Also, this can be served hot or cold depending on your own choice. For the Pinoy style of this Potato Salad, it just requires the following: diced potatoes, cheese, mayonnaise, sour cream, onion, calamansi juice and pepper. The simple instructions are written below so you just have to follow it to attain a good tasting potato salad. You can either serve it hot or cold. For some nutritional facts, as we all know, potato is very good source of carbohydrates. On our case as Filipinos, we can substitute it for rice. Do you know that eating potatoes can increase brainfunction and help prevent cardiovascular disease? Well yes. This vegetable has a lot of use. So then, I assume you are now swayed to cook and prepare this wonderful dish. Have a nice cooking! a rich Filipino style potato salad composed of diced potatoes, cheese, mayonnaise, sour cream, onion, calamansi juice and pepper. Combine sour cream, mayonnaise, kalamansi juice, finely chopped onion, garlic, salt and pepper. Add diced potatoes and sliced pepperoni. Toss to coat evenly chill. Serve sprinkled with finely grated cheese.